Titanic Beach Lara is situated on the beautiful coast of Lara in Antalya, Turkey. Considered the ‘Pearl of the Mediterranean’, Lara beach is known for its golden sands and clear, blue waters. The family-friendly property, with its 586 rooms spread over an area of 95 thousand square meters, is one of the best hotels in the region, which has won awards and accolades for its breath-taking thematic architecture, superior guest services and chic and elegant interiors. The hotel houses a selection of superior restaurants and bars serving from Turkish and international cuisines to fine wines. For leisure and entertainment, guests have a wide variety of options, which include sunny beaches, outdoor and indoor pools, rejuvenating spa offering a range of treatments, fitness room, football fields, tennis courts, nightclub, disco and entertainment programmes. Children can enjoy at the kids’ club that offers a slide pool, kids’ restaurant and games room. The hotel is a part of the ‘Titanic Hotels’ of the AYG Group, which has a chain of hotels, all boasting Titanic-inspired architecture and maritime themed decor. Titanic Beach Lara is located in the beach resort of Lara in Antalya, Turkey. It is easily accessible from Antalya town. There are regular bus (Dolmus) bus services between Antalya town and Lara beach. The distance is roughly 11 km. The Dolmus stop is just outside the hotel. Antalya Airport is around 8.5 km from the hotel. Among the nearby attractions are idyllic fishing villages and Duden waterfall. 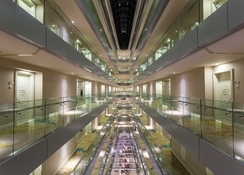 All the 586 rooms at the hotel are spacious and elegantly decorated. There are plenty of options for accommodation in Titanic Beach Lara. A standard room comes with air conditioning, mini bar, LCD TV, personal locker, internet and telephone connection and bathtub. There are also standard garden rooms, standard pool rooms and family rooms. 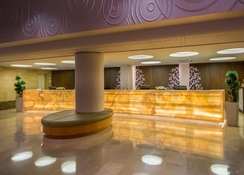 The hotel offers three types of suites: junior, colonel and admiral. All the suites are sea-facing and are furnished with terraces. There are some specially designed rooms for disabled travellers. 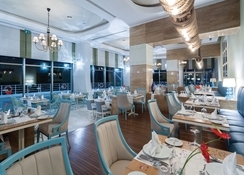 The restaurants in Titanic Beach Lara present an eclectic mix of international and local cuisines. 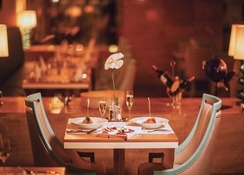 There is Parkfora main restaurant, which serves lavish buffet spreads for breakfast, lunch and dinner. Hasir a la carte restaurant is famous for bringing to life some of the most traditional recipes of Turkey. Pascarella a la carte restaurant is known for giving a twist to the traditional Italian dishes, while Capari a la carte restaurant serves delicious and fresh seafood items. 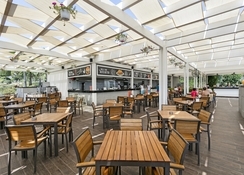 The snack menu can be tasted at Stella snack restaurant, while Pita Pan restaurant serves traditional Turkish baked goods in an open-air environment. Finally, there are as many as 9 bars scattered throughout the property, where one can have a drink or two. The Caprice Bar and Patisserie serves tea, coffee and mouth-watering pastries throughout the day. A beach hotel is not complete without its mandatory poolside. 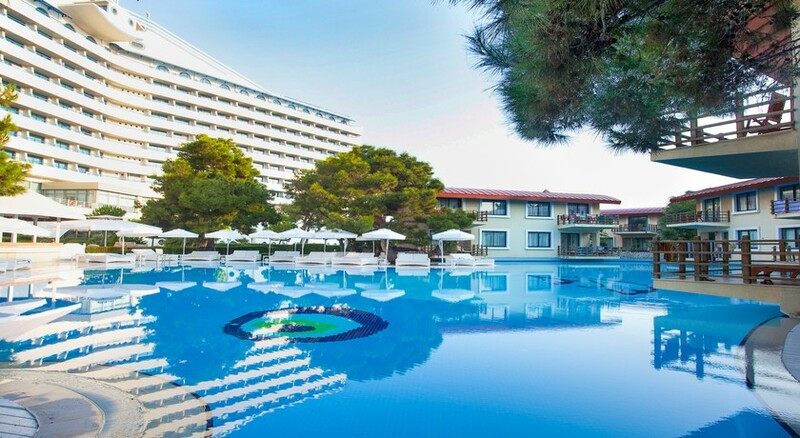 Titanic Beach Lara Hotel has a main pool, a children’s pool, an Olympic and a half-Olympic pool and a pool with waterslides. The Olympic pool is situated indoors and is heated during the winter months. Additionally, guests can choose to lounge in the beach front, which is lined with palm trees and miniature, white gazebos. For more active souls, there are 4 professional turf football fields, 4 tartan tennis courts and a fitness centre, equipped with state-of-the-art Techno Gym Sports equipment. The outdoor nightclub, called Ocean Disco, puts up wonderful shows and dance performances. The in-house spa, called BeFine Spa, has star-shaped steam rooms and saunas made of Finnish pine trees. While adults busy themselves at the beach or at the pool, children too can have a fun time at Tini Kids Club, which has specially designed games with instructors in different languages. Stunning Hotel For The Sun! The Titanic hotel was so much better than what we expected. This was the furthest East we had travelled, and we shared the hotel the travellers who came West, and it was a great crossing point. The first night we arrived a waiter in the main restaurant brought us drinks -all of which are included in the price- and the next day he laid out our evening table complete with our drinks waiting for us. The food was freshly prepared, and had an Eastern angle that allowed us to try regional dishes we'd never have considered; there was almost TOO MUCH choice! PLUS the BEST chips you've ever tasted, and they proved very popular! The rooms are well appointed, with solid oak quality furniture. Robes and slippers are provided, and there is a mini bar in the room that gets stocked every day with soft drinks, water and some beers. As the resort is ALL INCLUSIVE other drinks can be had from the bar, including cocktails and fine whisky. The pool area is great, as there are several pools, and you'll be able to get a spot all you own, and the outside pool closest to the gym is heated, and guests loved this. Kids AND adults alike loved the flumes, and there is a pirate ship for them to clamber over too. There's even a pool for lane swimming! There are low-rise "flats" that are termed as family rooms, and the family we met loved them, and apparently they are very popular. They have 2 bedrooms, and have a set of bunk beds too for kids. I highly recommend this hotel. If the sun is out, there is no need to leave the complex, and it's a keenly priced, high quality destination in itself. I would definateiy go back!!!!!! The hotel was fabulous, loved the cabanas by the pool. The only fault was that the family rooms are not part of the main hotel, so we felt a bit like the poor relations.